The Fisher Isotemp Plus Chromatography Refrigerator provides you compact storage with digital control and precision for your chromatography needs. This 19 cu ft. capacity laboratory refrigerator has a clear, energy efficient double pane glass door that allows you to view progression easily. The door is also filled with inert argon gas for excellent temperature retention. The interior of the Fisher Isotemp Plus Chromatography Refrigerator is brightly lit and white for contrast and features a duplex outlet, and two 2inch access ports for instruments on either side. The Fisher Isotemp Plus Chromatography Refrigerator temperature range is between 1-12°C (34 to 54°F) with a stability of ±3°C. and is digitally controlled. The digital control panel of this chromatography refrigerator allows users to easily set parameters, with error codes to alert users to under or over temperature conditions. Temperatures chromatography refrigerator can be locked for added security. Note: Data logger seen on left side of refrigerator is not included. This is our test equipment. 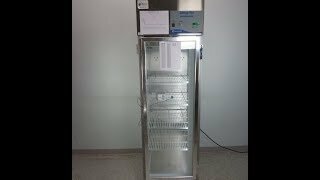 This Fisher Isotemp Plus Chromatography Refrigerator has been fully inspected and comes with current validation reports and a clean bill of health. All of our lab equipment comes backed with our standard warranty. Should you have any questions, please don't hesitate to contact us.